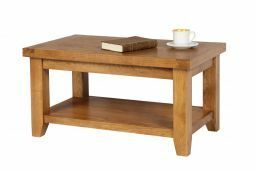 The Country Oak Coffee Table with Shelf is manufactured from premium grade sustainable American Oak and is finished with an oiled wax which brings out the natural beauty of the American Oak. These coffee tables have a nice and chunky design. Delivered fully assembled and ready to use. 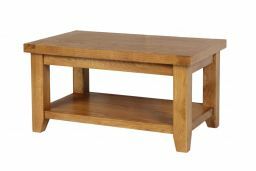 This coffee table is manufactured as part of our Country Oak Range so will match our country oak dining tables, dining chairs, oak TV units and sideboards. 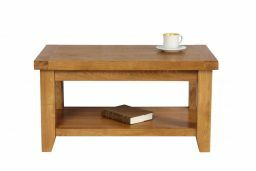 I purchased this coffee table to compliment a tv stand I bought previously. I am very happy with the look and quality of both and will be visiting Top Furniture for more items in the future. .
Quick efficient service from the office staff. Only took a few minutes to select the table and complete the order before the table was put in the back of our car by the warehouse staff. The table is good quality and sturdy. We are very pleased with the purchase. An excellent piece of furniture at a very competitive price. The delivery was first class on the agreed day with a call from the driver 30 minutes before arrival. A very happy customer. 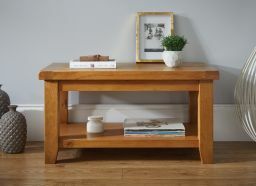 We are very pleased with our purchase of the Country Oak Coffee Table with Shelf. It is a lovely piece of furniture, of good quality and well made of oak and oak veneer. It was delivered on time, fully assembled and well packaged. Will definitely use Top Furniture again. 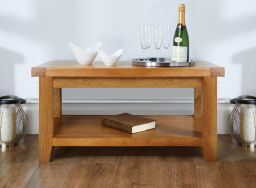 We were very happy with our coffee table and with the service provided. It was delivered within the time frame stated on the website and we received a call a week before as mentioned to agree a convenient delivery date. The item matched the description including the colour which was also important feature for us. We would certainly recommend Top Furniture. Lovely piece, great price, colour and appearance as photo and description shown on website. Great customer service and delivery: thanks Top furniture! It's a beautiful piece of furniture.very well made.im very happy with my purchase. Excellent quality of product, very good value. Good quality product, well finished. Packed very well. Delivered as quoted. Looks very nice with the grain in the wood showing. Good touch that's the top edges of the table are curved. Beautiful coffee table very pleased, all the top furniture sales people and delivery drivers helpful and friendly, thank you. Excellent piece of furniture, beautifully made in solid oak. We are delighted with the table and the customer service is second to none. Very highly recommended. Lovely piece of traditional furniture. Solid, beautifully finished. Great value. Very pleased. So happy with this coffee table, well made, attractive and value for money. Also ample room to accommodate a couple of small baskets to house magazines and the like. 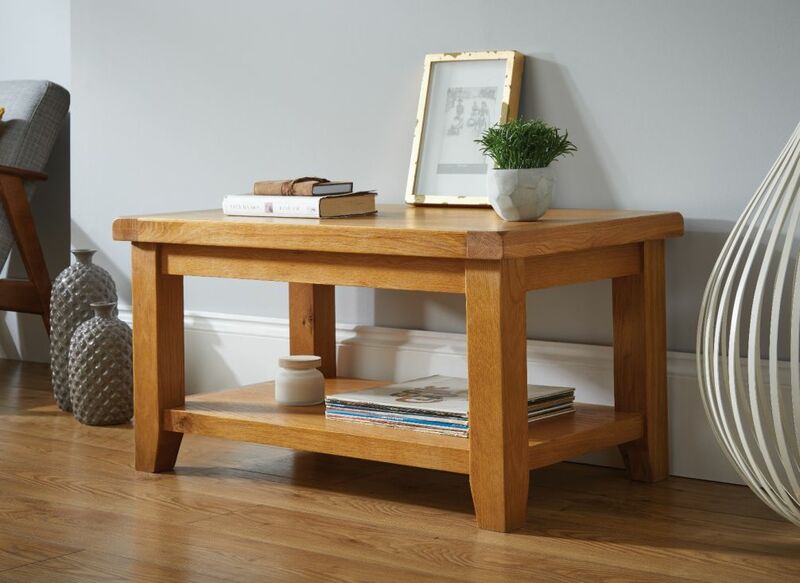 Great look, solidly built, matches our tables, benches and sideboard perfectly. For the money you can't really go wrong.